Stephanie Dray & Laura Kamoie's latest book is out today, and as if that weren't exciting enough -- it's about Eliza Schuyler Hamilton! If you haven't already scooped up a copy of MY DEAR HAMILTON, go ahead, then come back here to read Stephanie's #WomensHistoryReads interview when you're ready. Stephanie: Everybody loves a rebel--a woman who rips up society's rules and sets the world on fire. And I love those ladies too. And yet, I've been drawn again and again to write about historical women who are left to sweep up the ashes and rebuild everything anew. Cleopatra's daughter, Martha "Patsy" Jefferson Randolph and Eliza Schuyler Hamilton are all women who found ways to assert themselves within the system. Women who were left to pick up the pieces after wars, death and destruction. Women who never got enough credit for what they did in the shadows. I think there are a lot more women like that in the past--and the present--than we realize, and their quiet strength, grit, and determination are a true inspiration to me. 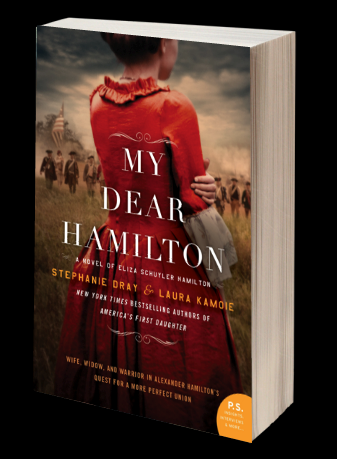 Stephanie: My new novel, co-authored with Laura Kamoie, is MY DEAR HAMILTON: A novel of Eliza Schuyler Hamilton and I'm so excited about it. It's been a long time in coming--it took us about 18 months to research and edit it--but after seeing the Broadway musical on Hamilton and reading Ron Chernow's excellent biography, we were both eager to know more about Eliza and I think readers will enjoy seeing her take center stage. To my knowledge, ours is the only fiction novel that covers her life before and after Hamilton, and we think that's such an important part of exploring a woman who achieved so much on her own. And it releases today! Stephanie: Oh, this is a fun question that gets bandied about in the historical fiction genre a lot. In my opinion, historians and historical fiction authors have two very different, but overlapping, jobs. Ideally, historians should be relatively even-handed in educating the public about the various possibilities and interpretations of historical people and events. Novelists, by contrast, have to pick a side. They have to not only pick a theory of what happened, but weave a story around that theory as if it were objectively, and not subjectively, true. Thus, even though I do the same research that any historian would do in writing non-fiction, (and sometimes a bit more) my purpose is different. I am a novelist, first and foremost. My duty is to the story and to the reader. Whatever civic duty I owe to history is a matter between me and my own personal mission statement. There are many fine fiction authors who are also trained historians with the degrees to prove it--but just as many who get confused trying to wear both hats and their stories suffer as a result. Greer: I hear you. The "duty... to the reader" always takes center stage for me. That and a good Author's Note. Stephanie: My question for you is: What is one thing you wish your fiction-writing colleagues would stop doing? Greer: There isn't much, but here is my number one, huge, blinking-neon-sign pet peeve: writers who tear down other writers, either individually or by genre. Anyone who says, "Oh, I don't like X genre" in an interview, or implies that one genre is easier or lesser than another -- that really gets my goat. Everything is genre. Yes, including literary fiction. I've been really disappointed when authors whose work I admire are featured, for example, in a "By the Book" feature at a certain major newspaper, and then make some offhand remark like "I don't read romance, of course, it's so predictable" that shows ignorance at best and mean-spiritedness at worst. Writing, and especially publishing, are hard enough without certain writers using their platform to dismiss other writers out of fear, thoughtlessness, or insecurity. I'm always looking for opportunities to include and build up other writers instead of competing with them. There's room in the tent for all of us -- that's how projects like #womenshistoryreads get started!